Save an extra £15 OFF all Virgin Atlantic and Delta Air Lines USA flights! Enter promo code FRESHWEST at the checkout. Book NOW! Travel in style by booking Virgin Atlantic & Delta Air Lines fares at StudentUniverse. Whether you're looking for a cheap student flights for holidays, to go back and forth when studying abroad or for a gap year trip, you'll be able to access huge savings on discounted student fares with Virgin Atlantic & Delta Air Lines. North America: New York, Boston, Los Angeles, San Francisco, Miami, Las Vegas, Orlando, Atlanta and a whole host of other destinations in partnership with Delta Air Lines. and a whole host of other stunning destinations including Cancun, Barbados and many more. Virgin Atlantic Economy is an easy journey from start to finish. Even the formalities are simple. Save time by checking in online, choose your seat, and then breeze through the airport. Your comfortable seat has room to work, sleep or just relax. It has a 31in (79cm) seat pitch, plus an adjustable headrest. Need more space? You can easily upgrade to an extra legroom or exit row seat at check in. For dinner, your menu has a choice of three tasty meals, including a vegetarian option. On day flights, enjoy your meal with a speciality cocktail served with or without alcohol. If you’re flying at night, there’s hot chocolate to help you sleep. Complimentary drinks are available throughout the flight. On night flights, you’ll also be offered a complimentary amenity kit. It’s packed with everything you need for a great sleep, including a toothbrush and toothpaste, socks, an eye mask, and earplugs. If you don’t feel like sleep, then check out the Vera on demand inflight entertainment system*. There’s a fantastic choice of over 300 hours of award winning movies, TV shows, music and games. * On demand entertainment available on all A330, A340-600 and 747 aircraft. 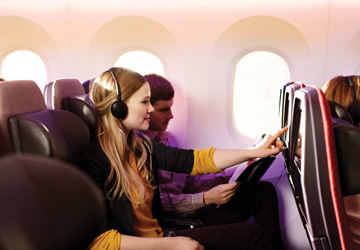 Virgin Atlantic is the first airline in Europe to offer WiFi on all services! All passengers can now stay connected across the entire fleet, meaning whether you are flying to the USA, the Caribbean, Africa, Asia or the Middles East, you'll always be able to stay in touch. Virgin Atlantic's entertainment system is second to none, with the latest Hollywood blockbusters, tremendous TV and the latest chart toppers - plan your flight entertainent before you fly at the inflight entertainment page.